Last week, Kawasaki released a list of their Ichiban dealers (Full Press Release Below). These dealers are recognized by Kawasaki as ones that are above and beyond their peers in various categories. See the complete list of dealers in the image below. 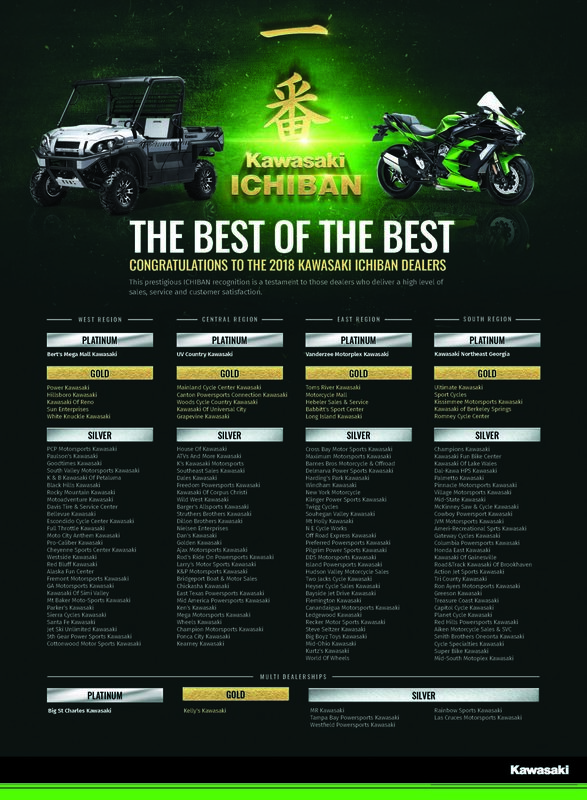 FOOTHILL RANCH, CA – September 28, 2018 – Kawasaki Motors Corp., U.S.A. (KMC) is pleased to announce the 2018 Kawasaki Ichiban Dealers who have met the very highest standard in sales, service, and customer satisfaction. Through multiple qualifications, these 156 dealers from across the nation have gone above and beyond to stand out amongst their peers. In Japanese, Ichiban is used to describe the best, or No.1 in a certain discipline or category. Kawasaki dealers can achieve Platinum, Gold, or Silver level by excelling in vehicle, parts & accessory sales, extended warranty, Kawasaki Owners Relationship Excellence (K.O.R.E.) score, online dealership staff training and more. From each of Kawasaki’s West, Central, East, and South Regions, one dealer is recognized as Platinum, six reach Gold, and a combination of the Regions complete the Silver recognition. Congratulations to all Kawasaki dealers for their continued support and achievements with Kawasaki.